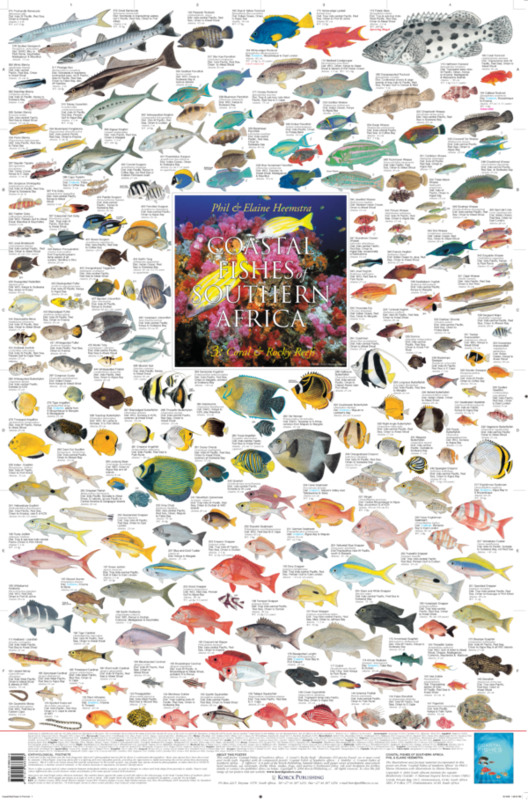 This comprehensive and colourful poster depicts an amazing 169 beautiful fish species which are to be seen by scuba divers and underwater photographers on or near coral and rocky reefs of southern African coastal waters. The beautiful artwork is by Elaine Heemstra and is from the magnificent book “Coastal Fishes of Southern Africa” by Phil & Elaine Heemstra published by the South African Institute for Aquatic Diversity in Grahamstown, South Africa. Scale: fish over 50 cm in length are shown at a scale of 4 cm to 50 cm. Fish under 50 cm are shown (with some exceptions) at approx. 2 cm per 10 cm in length. Protected species are indicated “spearing illegal” as in the case of the large potato bass. Where applicable, slow-growing species are indicated by the maximum weight shown together with the number of years it takes that species to attain maximum weight – up to 35 years in some species! The alphabetical co-ordinates ensure quick location of the species you may be searching for which is particularly important in a really very busy poster such as this one. This poster is the third in a series covering most of the fishes to be found in southern African waters. The three posters are a must for any angler, scuba diver, fisherman or rock fishing enthusiast. Alternatively these posters have huge appeal for both young and old who while not perhaps having a defined interest in fishes, can appreciate the incredible beauty with which Nature is so generous. Among the fish families illustrated on this poster are: anemonefish, angelfish, barracuda, blenny, butterflyfish, cardinal, emperor, fusilier, goatfish, goby, goldie, hawkfish, hogfish, jobfish, kingfish, moray, parrotfish, puffer, rockcod, rubberlip, seabream, squirrelfish, stonefish, surgeon, snapper, soapfish sweeper, triplefin, unicornfish & wrasse.